Within in the heart of one of America’s most bustling cities, you might not expect much greenery among the towering buildings and crowded streets. The city of brotherly love, however, is home to a great number of community gardens that can be found just around the corner where you’d least expect. 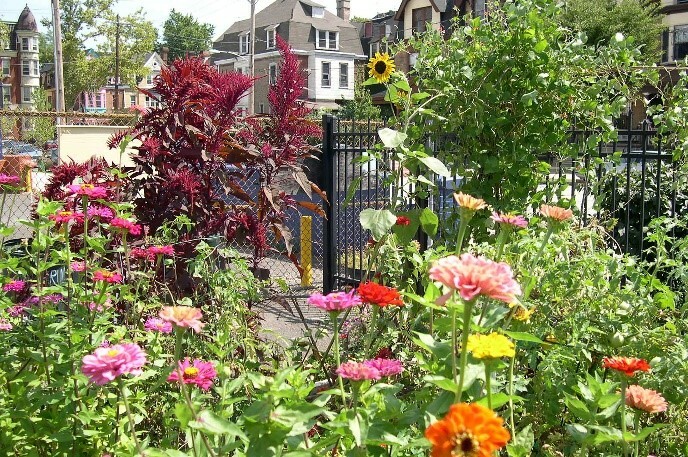 Like small oases of vegetation in an otherwise concrete jungle, Philly’s community gardens allow local plant enthusiasts to plant a wide variety of vegetables, fruits, and flowers. Within the gardens, you can find grape vines, plum trees, kale, tomatoes, daisies, or pretty much anything else that can grow in Pennsylvania’s humid climate. Centered in a very old and highly industrialized city, however, many gardens are built on top of layers of concrete and demolished building sites. They are also often just downhill of many busy streets. This raises the concern of potentially high lead levels within community garden soils. As many gardens grow a variety of edible produce, Warrington Community Garden gardeners must keep in mind the lead uptake of their crops to ensure their produce is safe for consumption. According to the EPA, produce grown from soil with over 400 ppm of lead pose a risk to human health. This semester Jisoo Kim, Mia Mansour, and I have been working with Ph.D. student Emma Harrison and Dr. Jane Willenbring to help test lead levels within various community gardens in West Philadelphia. 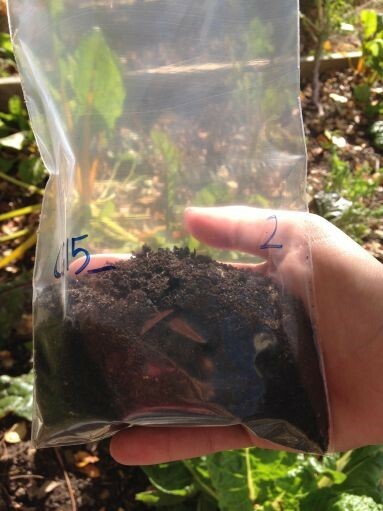 We have been to 6 different gardens to collect soil samples. We brought the samples back to Penn for lab analysis. Although most of the collected soil has acceptable levels of lead, a few samples collected next to building walls or on top of demolished building sites have considerably high levels, as expected. However, this is not a problem that can’t be fixed! By removing the top layers of soil and adding fresh new layers, lead levels can be diluted into a more acceptable range. We hope to inform gardeners of any potential health hazards due to high lead levels, so that they may produce fresher, lead free crops! Although we have tested lead levels within a few community gardens, we hope to reach more local gardeners through our annual Soil Kitchen event on April 23rd. From the hours of 11am to 2pm, anyone can bring their soil samples to the Dirt Factory on 4308 Market Street to have their lead levels tested while enjoying a free bowl of soup. The idea is to promote healthy gardening throughout the Philly area, and we are expecting a great turnout!